I may have been doing this continuously since 2008, but there have been other times over the years when I felt compelled to make comics about my life, for whatever reason. Those comics have taken many forms and a few different looks, and I’ve decided this site would be incomplete without them. This is the crown jewel of the Prehistoric Comics Collection. This is where the action is! I was in real college from 2000-2003. 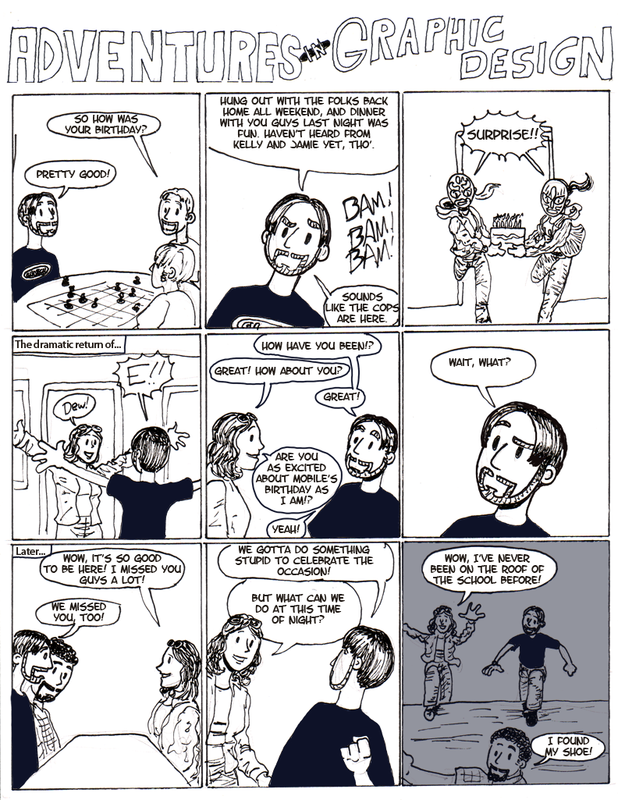 In 2001, I met Kelly, and through her, I met basically everyone I knew in college, including a lot of people who appear in my comics even today. These are early adventures. 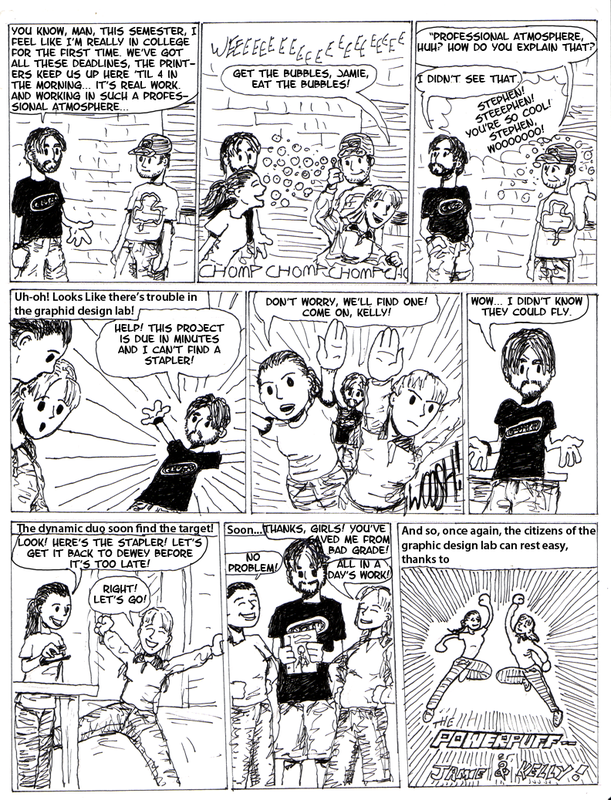 They were conceived as an actual comic strip, inspired by pages from Evan Dorkin’s Milk & Cheese and Shannon Wheeler’s Too Much Coffee Man, among others. So there was a title across the top, the characters had costumes, and the action is not exactly historically accurate, at first. The first three pages are goofy nonsense loosely based on real events, but after that, it gets more and more realistic. Really. Even the ninja one. The only revision I made was to add a screen of gray to night time scenes. At the time, I was dedicated to trying to communicate everything with just lines, no cheats, but how are you gonna paint the sky black like that, smart guy? So I added gray to indicate night time, where applicable. Ok, let’s go. 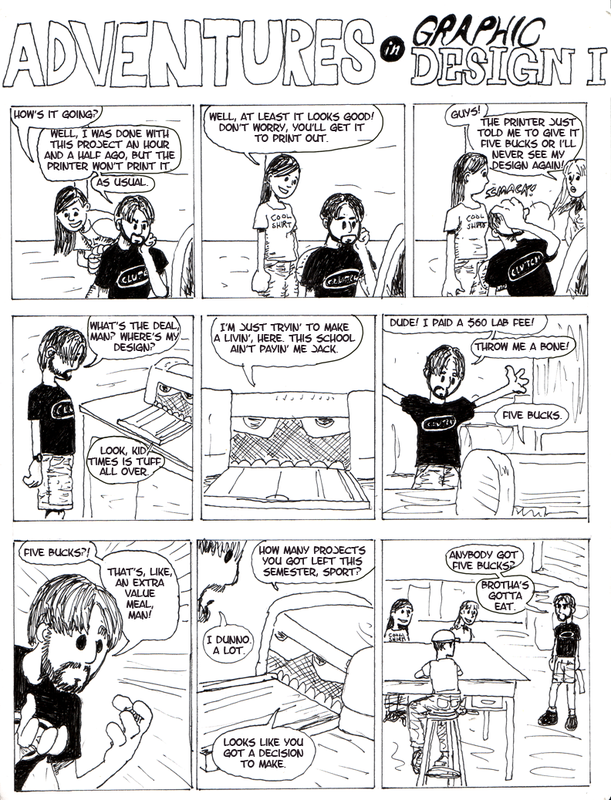 This first page introduces us to Kelly, Stephen, Ann and me, tryin’ to get by in Graphic Design I. It is presented with the original hand lettering, because it is remarkably legible, but the rest have computer lettering added so you can actually read them. Trust me, this was extremely necessary. I promise, this stuff gets a bit less stupid in a couple pages. The PET was some kind of printer, a simple office printer in the corner of the design lab that we used for tests as opposed to the fancy kind we used for our final projects. 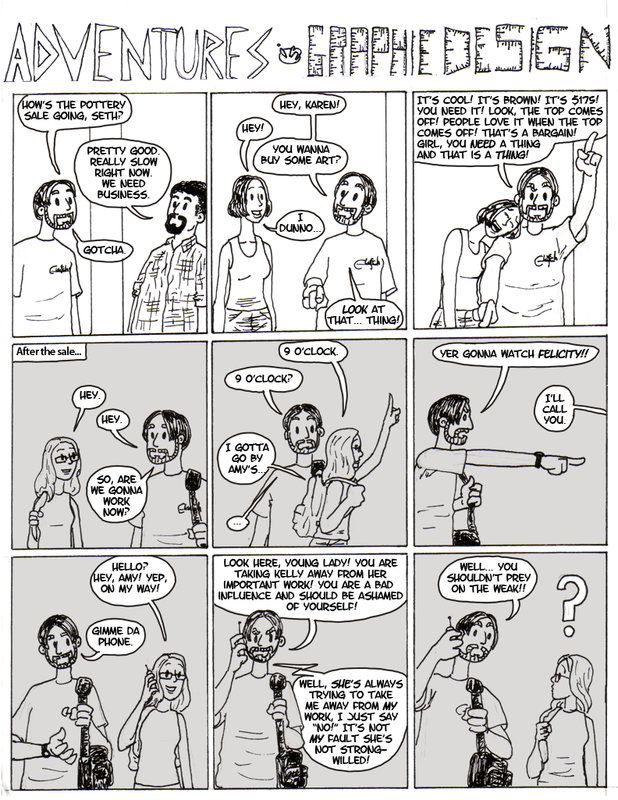 Page 2 introduces Jamie to the cast. Jamie & Kelly in the 2nd & 3rd panels up there happened pretty much word for word. The girls were pretty into Powerpuff Girls at the time. The printers in the design lab were notoriously unreliable and often seemed genuinely unwilling to produce our material. More new characters on this page, but 2002 me was nice enough to label them this time. Surprisingly accurate. Poor Kelly. That was the only project that ever defeated her. As I recall, she worked through the night without sleeping and still didn’t finish in time. That Josh guy never followed instructions and never showed up to class. Kelly had those masks hanging on her wall. E graduated a year ahead of me and moved to Birmingham. But one fateful night, she returned to campus to see who was around, and lo, we were around. We bought ninja masks at Walmart, changed into black clothes, and went to Kelly’s. We just happened to run into Jason in the parking lot and used him to get into the apartment. 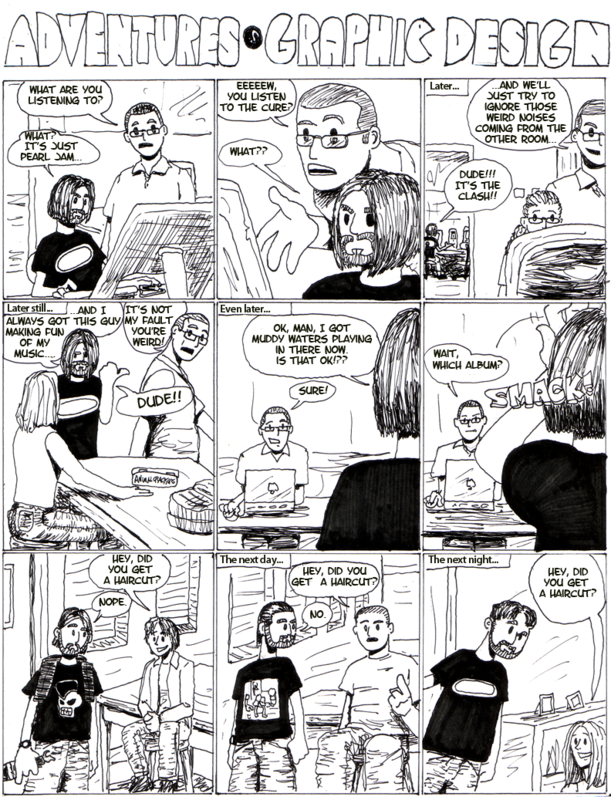 This page features Jordan, Jamie, Kelly, Sarah, Ann, a dude called Alan, and graphic design department head Ben Simpson. Now comes the tricky bit. I never drew comics for my final semester. These things were just for fun. Their major method of distribution was me taking them to school and passing them around. I was too busy to make comics during the semester, and once it was over, it just didn’t seem worth the effort to draw the the comics I had sketched out. The project fell by the wayside. But I kept all my roughs. Roughs for more comics than all the previous semesters combined. And a few weeks ago, I unearthed them, and decided to undertake the task of finishing a project dormant for ten years. I tried to be as accurate as possible. I researched backgrounds and clothes meticulously from photos. I tried to mimic the way 2003 me drew. And I drew them on paper, like the old days. No Wacom tablet for me. Hopefully you wouldn’t notice the difference if I hadn’t told you. One page was even penciled back in 2003, but never inked. 2013 me inked 2003 me’s pencils. How wacky is that? But I won’t tell you which it is (It’s not the first page). Can you guess…? Let us begin! We begin shortly before school started before moving into the… second week, I believe. Kelly, Jamie and Ann here. 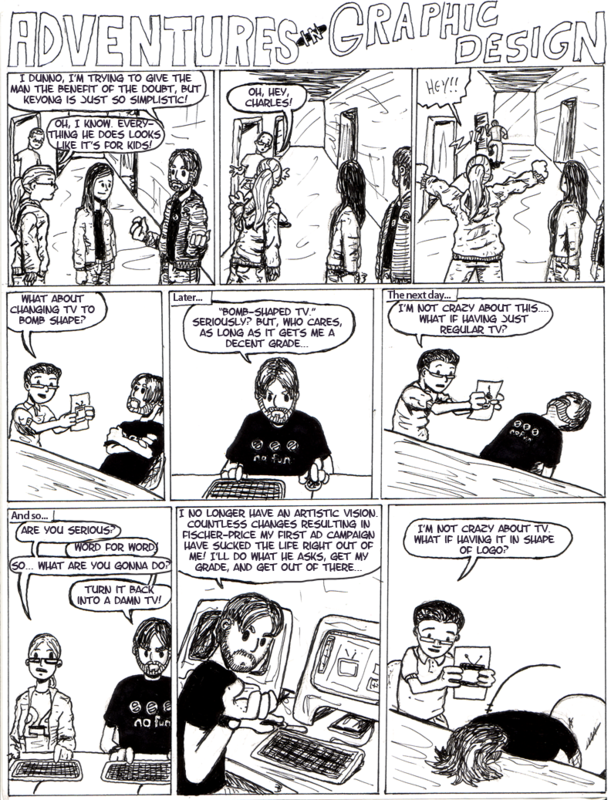 Here’s the debut of Lance, one of the most regular characters in the modern era, in the top strip. Kelly’s previously mentioned roommate and old friend Kim makes her debut on this page. Kelly was going to play capture the flag or something at the movie theater she worked at, I later found out. And hovercraft. That… is a long story. This page, thankfully, actually speaks for itself! This stuff’s gettin’ downright autobiographical! Much less jokey (But dumb gags are still coming). More like what I do now, really. Kelly & Amy were junkies for Felicity, y’all. 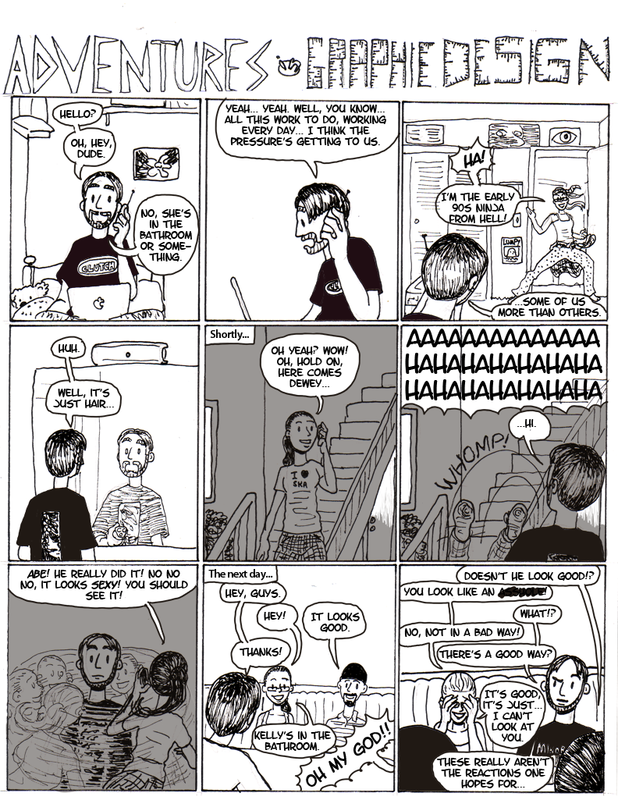 Top strip features Ty & Josh. All true. Jamie and I filled her room with balloons. My Mom baked her a cake! This was a breakfast for the STAR Awards, some kinda design awards. Kelly did win a prize, but it was just included in that envelope full of prizes for people from our school. It was way down in Gulf Shores, thus we had to get up crazy early to get there, and Kelly was out all night the night before. She called it “Secret life!” because everyone we knew was asleep. The lady in the middle is called Trudi Snodgrass. Not only do I remember her (memorable) name, I saw her at the movies awhile back. I’m good with faces. This takes place later that same day. That was one of the most eventful days of my whole life. Here we meet Alan, who you may remember from the memorial comic I drew two years ago. It was… bittersweet drawing this. I wanna say the luau party theme was Jamie’s idea? It was a rollicking night. 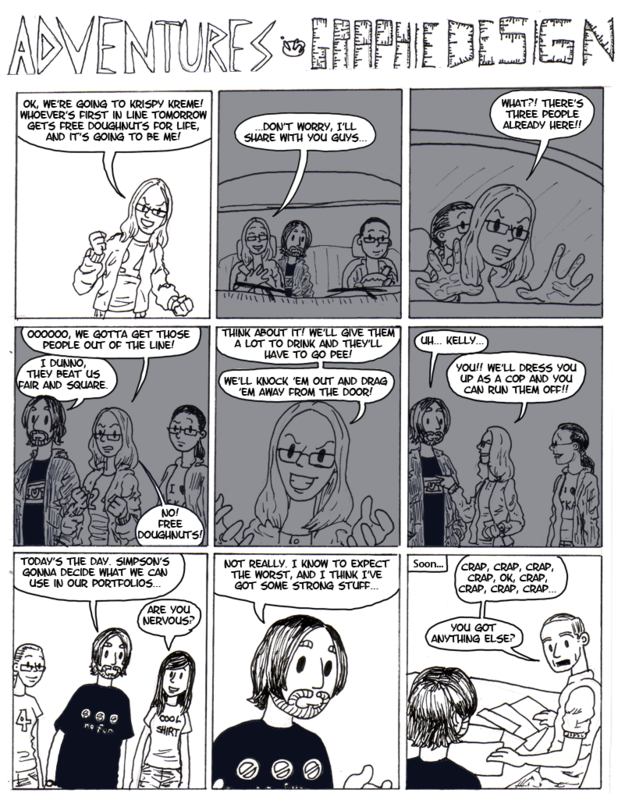 So much more stuff I coulda drawn about… Bottom strip’s background is filled with Tim, Gurinder, Seth, Lance & Erin, Kim, and Jordan. Basaba’s is a place Jamie took me to a year prior, and apparently forgot about. Nights like the bottom strip were sadly not uncommon. This was a brutal semester, in spite of how off-topic these comics tend to be. Everything on this page really happened. …and all the dialogue is 100% accurate. Some things in these comics, I remembered pretty well, some I didn’t remember at all. Those reactions… very vivid, as you might expect. Jamie had been telling me to cut my beard into an Abe Lincoln for awhile, at this point. I ended up keeping it for years. Ty again down at the bottom. Our portfolios were judged by Simpson, Keyong and art history professor Dr. Bantens. I was friendly with Bantens and hoped that would be to my advantage. Poor Reuben is asking for a portfolio case to put his work in down there, not for work to show, for the record. 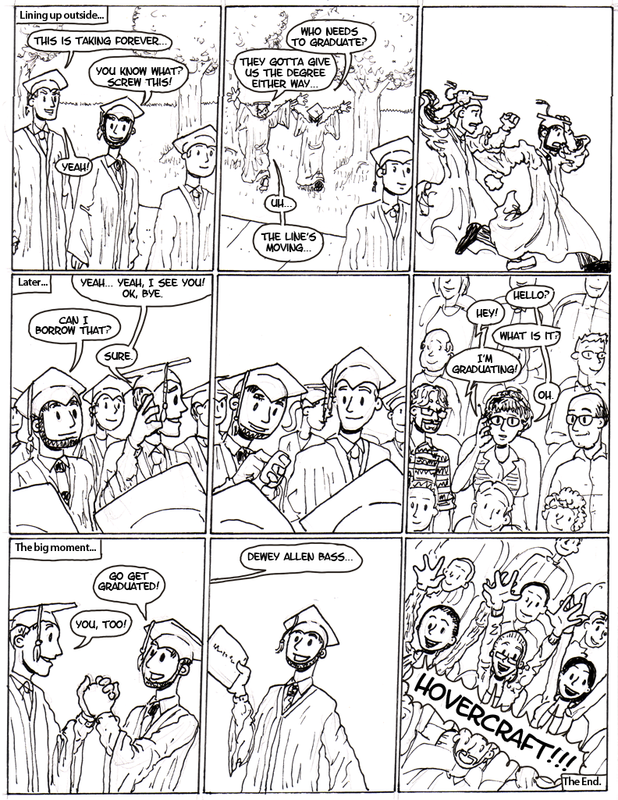 Some cat comics, wherein we finally see the previously mentioned Amy, and then graduation. 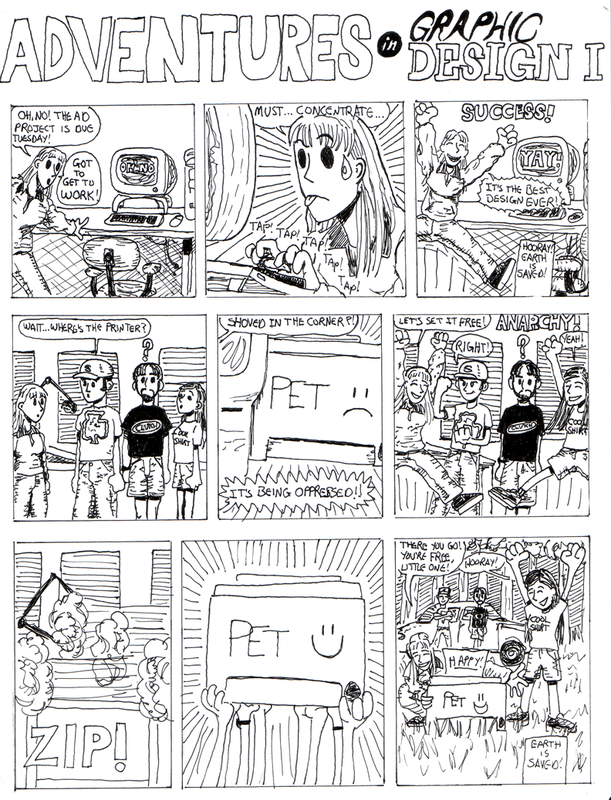 You’d think 2002 me would’ve made comics about his place being robbed and his main computer being stolen, but he didn’t. Jason was robbed at gunpoint in his car for his laptop with all his work on it, and barely managed to have work to show to graduate. That was a crazy story. I’ll be honest with you, I don’t recall who I called up in the stands. It could’ve been Kelly or Jamie, but I chose to make it my family just as an excuse to get them in here somewhere. And hovercraft again. 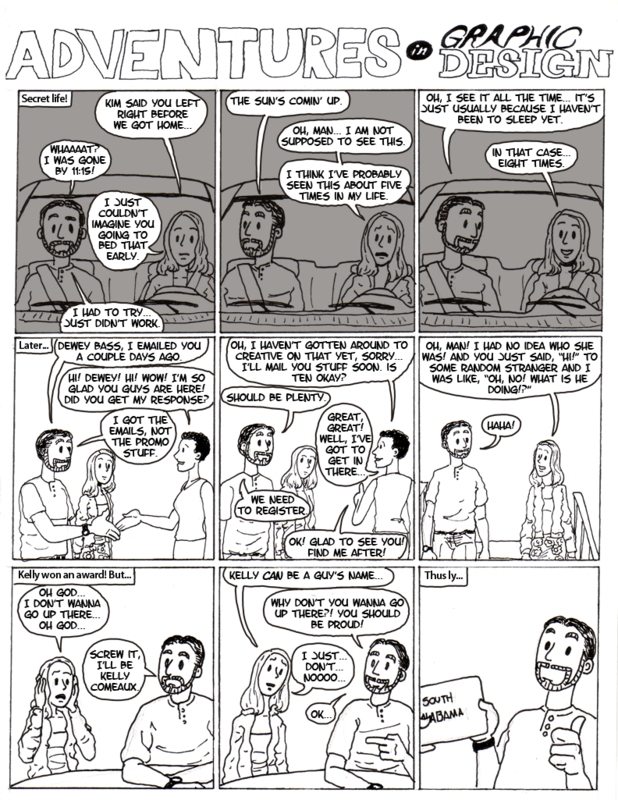 Feels fitting that the strip ends on Jamie, Kelly & Kim. And there you have it! It’s weird, what’s there and what isn’t. You’d think I woulda made comics about one of our legendary Halloween parties, or as I said, getting robbed, or any number of other events. I wish more people showed up more often. 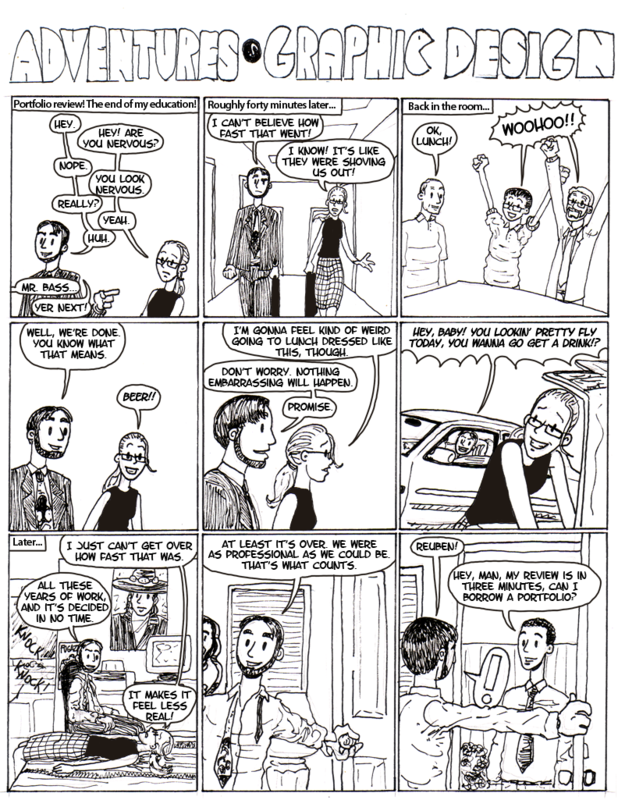 I wish I’d made comics about my entirely different group of friends back home, but I guess that didn’t seem to fit the mission statement of “Adventures In Graphic Design.” I coulda drawn about the time me & Kelly rode to Hattiesburg with Pete’s band to photograph them for school work. I coulda drawn about a lot of things. But I didn’t want to write any comics this far out. Finishing these has been a strange experience. It’s been a unique opportunity to not just look back on “the good old days,” but to actually see them from the perspective I had back then. I wrote all these when they were fresh. This isn’t me telling you how it was, it’s me telling you how it is… from the past! But leaving it up to future me to draw. I think that’s kinda cool. Immersing myself in the past for a week was kind of surreal, but pleasant. Regaining details I hadn’t thought of in years, moments, experiences… whole people, even. An interesting exercise. It’s made me think about how the vast majority of our experiences are now just murky, fuzzy one-line thoughts. I wish I could remember everything with the detail I’ve had doing these comics. I’m glad to finally have them up here to share.